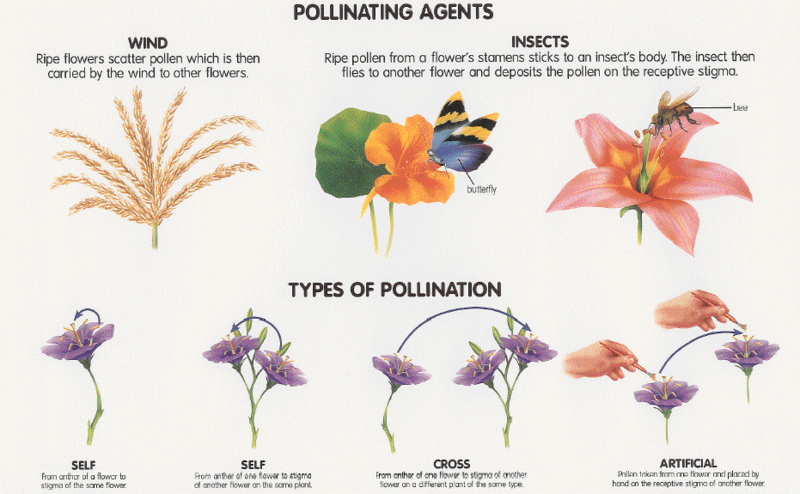 Understanding pollination is key to getting seeds to produce the plants you want. Seeds are the fertilized ripened ovule of a plant containing an embryo that is capable of germination to produce a new plant. Pollination is the transfer of pollen from a plant’s male part to the female part of the same or another plant. Pollination is required to create viable seed. Self-pollinator/“Selfer”- A plant with perfect flowers (containing both male and female parts) that usually pollinate themselves and rarely crosses with other plants. This includes wheat, beans, tomatoes, and lettuce. These are labeled for beginner seed-savers. Cross-pollinator/“Crosser”/”Outbreeder” – A plant that readily shares and accepts pollen with other plants of the same species, sometimes requiring pollen from another plant to set viable seed. Example: corn, carrots, cabbage. These seeds are labeled “expert” because it takes effort to keep them from crossing with each other. Insect-pollinated – Plants whose flowers are or can be pollinated by insects, such as carrots, broccoli, or onions. Wind-pollinated – Plants whose pollen is distributed through the wind. This includes beets, corn, spinach, and rye grain. Shattering – The breaking open of the seed pod or process by which ripe seeds separate from the seed stalk of a plant when they are dried. Usually, a seed saver wants to harvest and process the seed shortly before this occurs, lest they lose their seed. Isolation Distance – The distance required between two varieties of the same species in order to save seed that maintains varietal integrity. For wind-pollinated species, this can be 4 miles or more. For insect pollinated species, it is ½ to 1 mile.